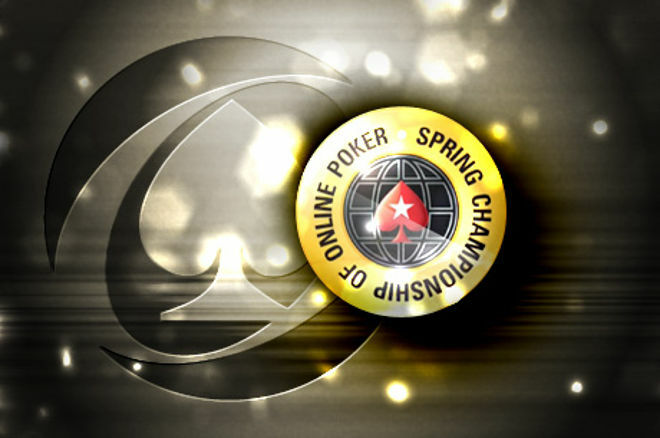 The PokerStars Spring Championship of Online Poker returns May 8-22 with a record 55 events. Check out the PokerStars SCOOP schedule, which has $40 million in guarantees across 55 tournaments. The Mountain Series may have concluded, but that only means bigger and better things are on tap for tournament players at PokerStars. The Spring Championship of Online Poker (SCOOP) will kick off Sunday, May 8 and run through Sunday, May 22, the company announced in a press release — and it will be the biggest in the history of SCOOP with 55 different events, divided as usual into three buy-in levels. This year's SCOOP Main Event, which begins May 22, will feature buy-ins of $100 (low), $1,000 (medium), and $10,000 (high). Those tournaments will carry guarantees of $1 million, $2 million, and $4 million, respectively. In total, PokerStars is guaranteeing more than $40 million in prize pools throughout the course of the series. Last year, "apostolis20" (low), Tom "tollgate" Grigg (medium), and Mustapha "lasagnaaammm" Kanit (high) were the winners of the prestigious events. A total of 140 of the 165 tournaments will last multiple days. New additions to the series for 2016 include a progressive super-knockout (buy-ins of $7.50, $82, and $700), an eight-max high roller (buy-ins of $215, $2,100, $21,000), a three-max turbo progressive knockout Zoom (buy-ins of $27, $215, and $2,100), and a mixed-max (buy-ins of $27, $215, and $2,100). In addition, players will have the opportunity to fight for a share of more than $100,000 in World Championship of Online Poker (WCOOP) tickets and cash by accumulating points across the low, medium, and high buy-in levels. The players who accrue the most points at each level will earn WCOOP Main Event tickets and $5,000 apiece along with trophies, while the overall points leader gets $20,000 and a trophy. Last year, PokerStars Team Pro Jason Mercier laid claim to Player of the Series honors after shipping three SCOOP events. The SCOOP debuted in 2009 with a 22-event series and has continued to grow in the years since. Past Main Event winners include notable names like Ari "BodogAri" Engel (low 2014), JC Alvarado (medium 2009), Ryan "toetagu" Fair (high 2010), Sami "Lrzlzk" Kelopuro (high 2011), Viktor "Isildur1" Blom (high 2013), and the aforementioned Kanit. Calvin "cal42688" Anderson is the record-holder for most SCOOP wins with six titles, one more than Shaun Deeb. Check out the full schedule for this year's SCOOP here.